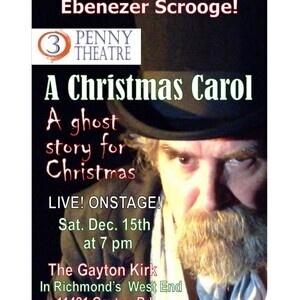 3 Penny Theatre will celebrate Ebenezer Scrooge’s 175th birthday by presenting A Christmas Carol: a ghost story for Christmas at the Gayton Kirk Presbyterian Church on December 15 at 7 p.m. The production includes a birthday party at intermission for the famous miser. A Christmas Carol is one of the best-known stories ever written, telling the tale of Scrooge’s redemption on Christmas Eve. 3 Penny’s production though is completely different from what audiences seen before. Instead of a large cast of singers and dancers, professional actor Ray Carver, as Scrooge’s creator Charles Dickens, tells the tale of the old miser by himself. Carver plays all the characters from Scrooge to the ghosts to the whole Crachit family, including Tiny Tim. Over 40 different characters in all! Chicago’s Writer To Writer magazine editor Barbra Croft says Carver presents this classic story as “a ripping good yarn.” The Minneapolis Star-Tribune says Carver’s work “catches the essence”. “A Christmas Carol: A Ghost Story for Christmas” is a one performance only event, Saturday December 15 at 7 p.m. The performances are at the Gayton Kirk Presbyterian Church in Richmond's far west end – 11421 Gayton Road, Henrico, VA 23238. Bring the family, this production is appropriate for children 5 and above. 3 Penny Theatre believes the arts are for everyone and Practices Radical Hospitality - All tickets are Pay What You Can - $1, $5, $10, $20 or more – Each audience member decides their own ticket price.